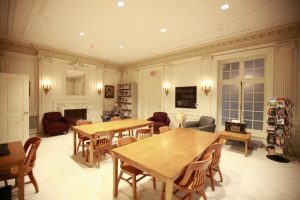 Curtis Institute of Music library reading room. The PACSCL Board of Directors accepted the membership application of the John de Lancie Library and Curtis Archives of the Curtis Institute of Music in early May 2018 , welcoming the organization as its thirty-eighth member. “The Curtis Institute of Music ranks among the finest of American conservatories, and we look forward to PACSCL programs and activities that build on the collective strength of our members’ music-related holdings with Curtis’s participation.” observed PACSCL board chair Ronald Brashear (Science History Institute), in announcing the Board’s decision. He noted that Philadelphia was an early center of musical excellence in America, and has produced many world-class performers, ensembles, and organizations. Current PACSCL members, including the Free Library of Philadelphia, the University of Pennsylvania Library, Princeton University, the Historical Society of Pennsylvania and others, also have strong music collections. “As Curtis itself has begun looking outward, its new mission statement reflecting its desire to engage a global community, the library and archives too begin to look outward, to encourage the use of our unique collections and to find collaborations that complement other collections in the Philadelphia area,” explained Michelle Oswell, library director, adding that they are eager to be part of future collaborations that will highlight their collections and the many connections between Curtis’s history and that of the Greater Philadelphia area. The Curtis Institute of Music Special Collections and Archives are a part of the John de Lancie Library, located within the Rock Resource Center in Center City, Philadelphia. The Archives, formally designated in 1999, holds over 340 linear feet of materials, including 66 donated manuscript collections, more than 400 audiovisual materials, and 8000 photographs related to the school’s founding, its concurrent and closely linked history with the Philadelphia Orchestra, its institutional history, and faculty and alumni materials. The Archives actively solicits donations from its faculty and alumni. Special Collections, holding over 2500 items, reflects the nature of Curtis’s founder in a wide-ranging collection of composers’ letters, autograph manuscripts, and first edition scores and books donated to Mrs. Bok and the school over the last 90 years. The Archives’ collection, in capturing the institutional history of a world-renowned music school — one of the finest American-based conservatories of music — is a fundamental resource for the study of classical music, opera, and culture from the early twentieth century to today. Curtis Archives is responsible for documenting and preserving the history of the Institute, encompassing all materials that chronicle the school’s functions, activities, culture, and values. In addition to administrative records of permanent historical value, highlights include the letters of Mary Louise Curtis Bok, the Curtis Institute’s founder; the Lynnwood Farnam papers (featuring detailed organ specifications and photographs); scrapbooks and diaries from a wide selection of alumni; and oral histories with notable figures in Curtis history, such as Joseph de Pasquale, Gary Graffman, Seymour Lipkin, and Vladimir and Eleanor Sokoloff.